I wanted to start sharing some of the background stories behind my images with you. 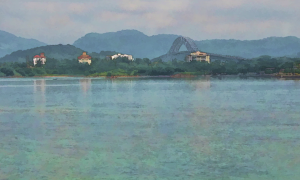 This first image depicts the Puente de las Americas, or Bridge of the Americas, which spans the Panama Canal to reunite the northern and southern portions of the American continent, divided forever by the creation of the awe-inspiring Panama Canal. Here the bridge is seen from Calle Oeste, close to the Plaza de Francia in the old district of Casco Viejo. 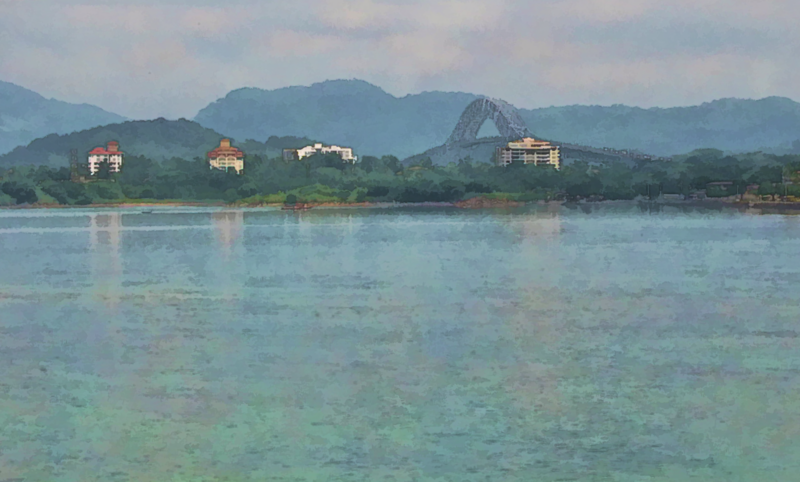 Looking across the Bahia de Panama (Bay of Panama), and over the district of Amador (formerly Fort Amador), the graceful structure of this cantilever bridge dominates the skyline despite the presence of the mountains behind it. Completed in 1962, this bridge formed part of the Pan-American Highway and was the only fixed link between North and South America until the completion of the Centennial Bridge in 2004. Although there are two other crossing points at Gatun Locks and Miraflores Locks, each of these are swinging bridges. Today the Puente de las Americas acts as the height limiting factor for ships traversing the Panama Canal, having a clearance of 201ft (61.3m) at high tide. The highest point of the bridge is 384ft (117m) above mean sea level, and the main span of the bridge is some 1128ft (344m), with a total length of 5425ft (1654m). The original photograph was taken during our trip to Panama in 2011, and has been post-processed in Topaz photoFXlab, giving it a more painterly feel. Dynamic contrast was added using Adjust, and Simplify was used in layers to combine both a watercolor effect and a secondary sketch effect designed to enhance the lines of the bridge and buildings.